Is your productivity suffering because you’re unable to check part sizes on the machine? Now there’s a solution. Our Diameter Measurement Gage can dramatically improve your production throughput by taking measurements while your part is still on a lathe, grinder or other machine center. The DMG360 accurately measures the diameter of large parts on-machine without needing to calibrate and sweep with a beam gage. The DMG360 is a contact type measurement device with a 3.75” diameter hardened and precision ground wheel coupled to a high-accuracy rotary encoder. The unit comes with built-in adjustments that allow for easy set up and the spring-loaded wheel ensures that you have the proper force while contacting your part surface. 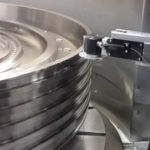 While using your machine center to rotate the part, the gage calculates the diameter by capturing the output of a high accuracy encoder and averaging four full rotations. 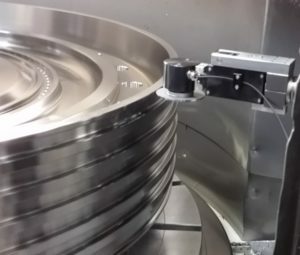 Each part rotation is precisely counted off by a proximity sensor. The digital touch screen built into the portable control box quickly displays the measurement results in an easily readable format. And to ensure readings are not distorted by the operating environment, an optional handheld IR thermal sensor is available. This allows you to enter the room and part temperatures and have the system calculate the compensation factor. The DMG360 includes an encoder wheel unit with a standard machine tool receiver to mount directly into your tool holder, portable touch screen interface and color display, proximity sensor with flexible arm and electromagnetic base, trigger with mag base, and a high impact carry case. 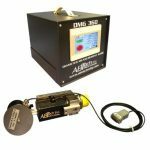 The DGM360 precision diameter measurement gage is designed to measure large diameter parts with better than .001″ (25.4 µm) system accuracy while still on a lathe, grinder or other machine center with repeatability of .0005″ (12.7 µm). As with any distance measuring device, accuracy is directly affected by variations in the surrounding temperature. That’s why we offer an optional thermal sensor that allows you to enter the room and part temperature. The DMG’s software then calculates the compensation factor for temperature changes. The versatility and portability designed into the DMG360 means it doesn’t have to be dedicated to only one machine in your shop. Common machine tool receiver mount options with alignment adjusters are available so the wheel assembly can be used in a variety of machines. These include Aloris, C5 Capto and other custom tool holders. For easy alignment to the part, adjusters are built into the wheel body. And there’s a visible reference guide for setting the proper amount of pressure to preload the measurement wheel. Proximity sensors trigger measurements and there are LED indicators in the sensor to assist with trigger alignment. The compact digital display unit includes a touch pad interface and comes with ABTech’s measurement software. That means there is no programming required. Just turn it on and go. We’ve even put a handle on the display unit to make it easy to move around the shop floor.